You’ve made it to South Carolina, and you’re now searching for the perfect beach party to kick off your summer. Where do you go? Stretching over 1000 feet into the ocean, get yourself over to the Folly Beach Fishing Pier, where every day tons of people fish, dine, enjoy the view, and… wait for it… party. On select Friday nights in the summer, the pier turns into a giant dance floor. And it’s a pretty sweet spot. 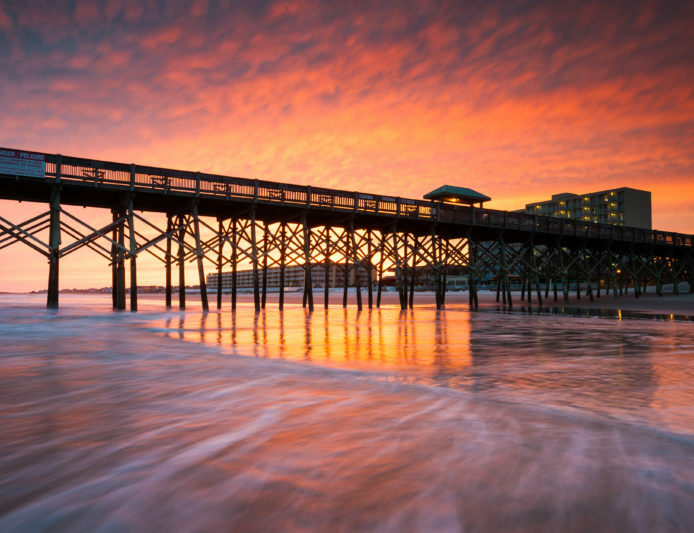 It makes perfect sense, as Carolina is the home of beach music and dancing — and you’ll see it all on the pier — the Lindy Hop, the Balboa, the East Coast, the West Coast — check it out here. Don’t worry, don’t worry, you don’t have to be a swing dancer. Get funky on the pier because it’s summer, and you’re at the beach, and maybe you’ve had a Charleston cocktail or two. And if you’re not a dancer, just go to see the pier at night and watch all the crazy professionals do their thing. It’s impressive. This is the spot to kick off your summer!